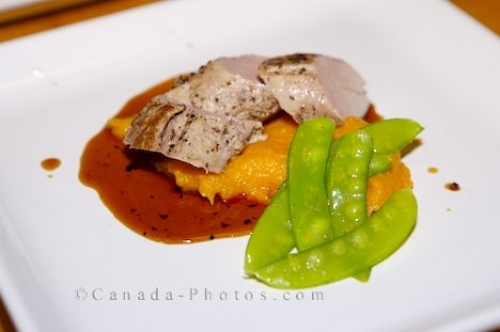 Prepared by a gourmet chef at the Rifflin'Hitch Lodge in Southern Labardor, Canada, this picture of an entree of Pork Tenderloin and peas is a fine example of food presentation. The presentation of a gourmet entree is very important when serving up some of the finest meals but the taste must be well beyond expectations. An entree of Pork Tenderloin accompanied by a special sauce and fresh garden peas served to guests at the Rifflin'Hitch Lodge in Southern Labrador always meets both expectations. Pork Tenderloin meal at Rifflin'Hitch Lodge, Southern Labrador, Labrador, Newfoundland Labrador, Canada. Picture of a gourmet entree of Pork Tenderloin and fresh green peas at the Rifflin'Hitch Lodge in Southern Labrador.